Religious conflicts, racial bias, family disagreements, or workplace tensions can lead most of us to be tempted to respond with a “they get what they deserve” attitude when someone experiences some sort of misfortune. But this is not the path of Christ. This is the focus of our Explore the Bible study: Compassion for Lost People. We will be focusing on the book of Obadiah and learning from the callous hearts of the Edomites. Long term conflict had been the status quo between them and Israel. When Jerusalem burned and the people of God were taken into captivity, the Edomites rejoiced. The result was God judging the Edomites for their arrogance and hatred. This week, a co-worker of mine pointed out to me my lack of compassion for a religious group based on my reaction to misfortunes some of them were experiencing. He reminded me that his sister and brother-in-law were giving their life as missionaries to that group, trying to help them understand their need to follow Christ. 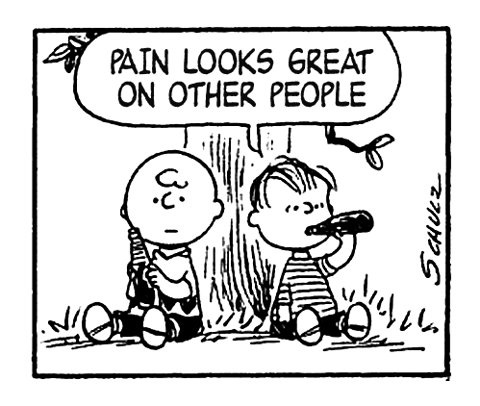 Sadly, we do respond to other people's misfortunes like the cartoon caption above, "pain looks great on other people," especially those we dislike. But Jesus taught a different lesson - check out what He said in Matthew 5:43-45. We must never forget that those who don't know Christ will stand before God for judgment and will be condemned to a place never intended for them (Hell); they will be eternally separated from the presence and love of God. This reality should prompt us to have compassion for them. Our compassion should translate into action! I have provided a set of PowerPoint slides you might want to consider displaying or printing. Click to preview and download.